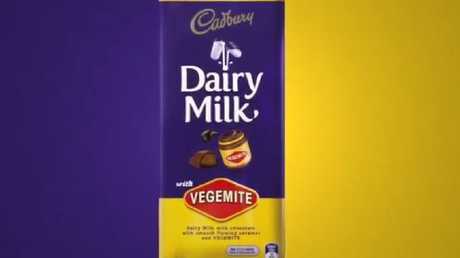 The most unusual Cadbury flavour combo since Dairy Milk with Vegemite? From next Wednesday, August 15, for a very limited time you'll be able to buy Cadbury Dairy Milk filled with potato chips. The two flavours, released to coincide with the footy finals, are CC's Original corn chips and sea salt Kettle Chips. The company said you can hear the crunch of the crisps when you bite into the bar. 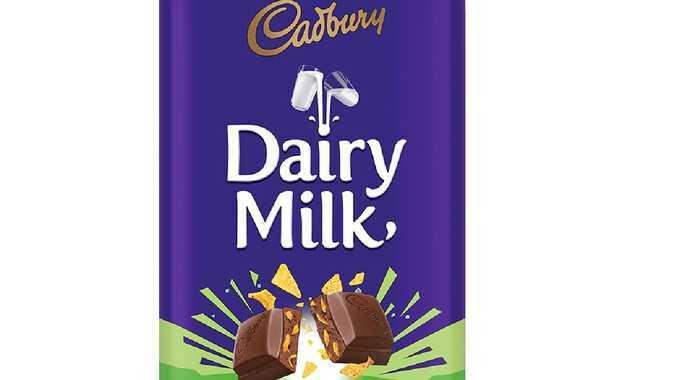 Cadbury marketing manager Kate Watson told news.com.au the new flavours were "disruptive" and "unexpected" but predicted they would win legions of fans due to their sweet saltiness. 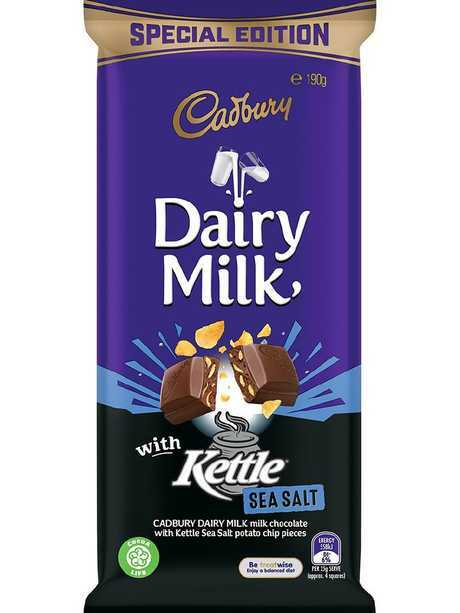 Cadbury Dairy Milk with Kettle Chips will be out from 15 August. 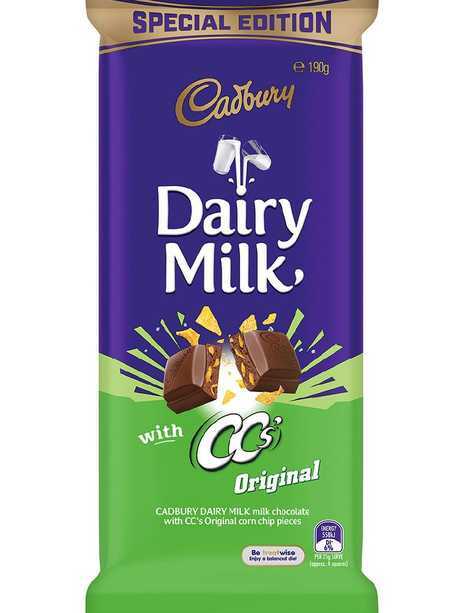 She said Dairy Milk with CC's or Kettle Chips was the most out there flavour since 2015's Cadbury Vegemite marriage. It raised eyebrows but was massively popular with the confectioner selling 1.2 million bars. At the time Cadbury's US parent Mondelez also owned Vegemite but has since sold the brand to Bega Cheese. "Vegemite is one of the favourite combinations we've done and this is the next in line of unusual flavour combinations," Ms Watson told news.com.au. "We know Aussies love chocolate and trying new things so we've brought these disruptive flavours to the market which combine sweet and salty, crunchy and smooth." Produced at the firm's Hobart factory, the bars' inspiration was the football, said Ms Watson. "When people watch footy finals they tend to sit down with family and friends and eat chips and chocolate together, so we thought why not literally put them together? "They're amazing, an unexpected sensation. They deliver something completely different - you can actually hear the crunchiness of the chips when you're eating it." 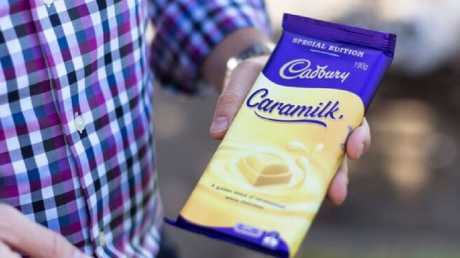 Earlier this year, Cadbury brought back one of its old favourites, Caramilk, which hadn't been on shelves for more than two decades. A pack of seven Caramilk bars was at one point being sold for $150 - that's more than four times the recommended retail price. But, alas, it's fame was short-lived. Weeks later, Cadbury recalled the bars when a fault was found in the manufacturing process. As for the famous Vegemite flavour, despite its success the company told news.com.au we'd never see the like again. 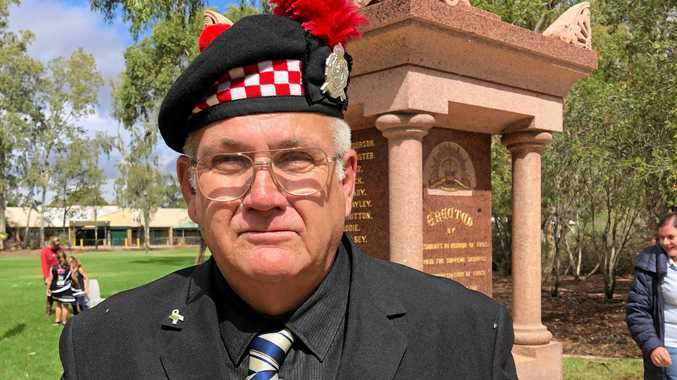 "While Cadbury Dairy Milk with Vegemite was a great product to generate interest and get people trying our products, it's not likely to be one we see back on the shelves anytime soon." "When I was a kid, on Sunday nights we'd have a block of Fruit and Nut to share with the family so it's linked to fond memories for me. "But I reckon my kids will be more into chips and chocolate." The two new flavours coincide with the footy finals.